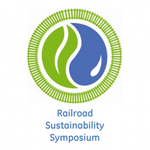 The Fifth Annual Railroad Sustainability Symposium was held last week at GE’s Crotonville campus outside of New York City. This year’s sponsors included the Association of American Railroads (AAR), BNSF Railway, Norfolk Southern Railroad, Union Pacific Railroad and GE Transportation. More than 60 participants shared insights on such issues as carbon markets, sustainability reporting and communication, sustainable sourcing or alternative fuel locomotives, and they represented railroad operators, manufacturers and environmental stakeholders from the US and Canada. On the first day of the symposium, UIC presented its strategy on energy efficiency and climate protection in the panel discussion “GHG and Carbon Markets”, moderated by John Lovenburg, Environmental Vice President at BNSF Railway. Additionally, Gabriel Castañares Hernández, UIC Senior Advisor in Energy and CO2, presented the UIC experience on energy data collection and sustainability reporting, highlighting the relevancy of companies’ contribution inside the Environmental Strategy Reporting System (ESRS), and the UIC strategy and targets for the medium and long term. A relevant part of the presentation focused on the integration of Guarantees of Origin and Green Certificates in the electricity procurement and the dual reporting based in the conclusions of the UIC Zero Carbon Project. One of the main goals of the panel was to show the impacts of Carbon Markets (as the EU ETS for electricity) have within railway strategies on sustainability topics, highlighting the possibility for railways to implement renewable energies in the procurement of electricity by implementing green certificates. The presentation introduced the Train to Paris campaign and the relevancy of the Railway Climate Responsibility Pledge, approved on 6 July at the UIC General Assembly. The goal was to show the international stakeholders the railway community’s engagement for reducing GHG emissions, facing the next COP21 to be held at the end of the year in Paris. The latest video of the campaign was presented in the dedicated app of the symposium for mobiles phones. This was the symposium’s fifth anniversary. It was established in 2011 when Norfolk Southern Corporation and GE Transportation recognised an opportunity to increase the dialogue about energy conservation and sustainable practices within the industry.